Come on in, set a spell! I've been a little under the weather in My World but beginning to feel better. Although reading and reviewing were accomplished, the time I had planned to spend answering e-mails was replaced by my pillow and the sofa. In the midst of all the review book reading (the reviews on the bottom two books coming up soon), I am taking a mental vacation by reading one of my all time favorite books, that link... here*. If I was on an island and only had a few books to take with me, this would be one of them! There was a little moving around here and there to put the Kitchen Aid back on the kitchen counter. More coming up soon. One finds pantry space where available. This cute table was a long ago thrift store find. It sits behind the Lazy Boy chair. Sometimes there are also baskets on the floor between the two when necessary. I was asked what is in the barn, I don't know as I have never been in it. The road leading to that farm is actually far down our country road. We had a brief warm up so the snow is not so deep as it was. At least we are not like our New England family who has snow measured in feet! I plan to do an entire post updating my scrapbook journal soon but here is an answer to a question from last week. Most of my washi tape has been purchased as I find it at various craft stores and box stores (ie: Michaels, Joanne's, Walmart, etc.) 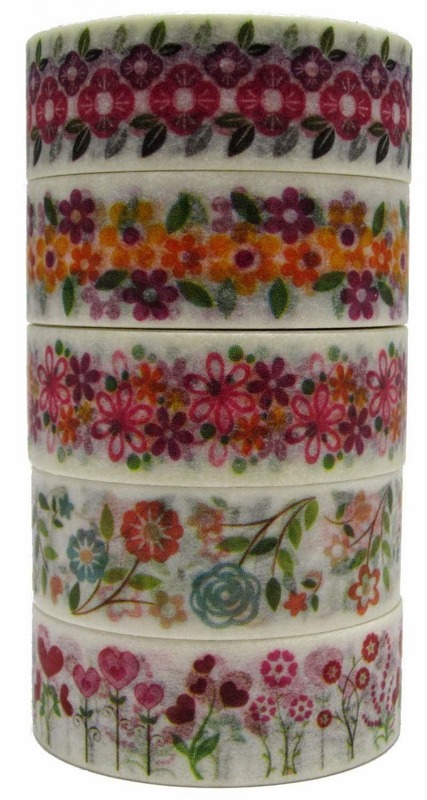 The washi tape used above was purchased in a package of three complimenting designs at Michaels. But I have ordered some through Amazon. The Vintage Christmas washi tape above come in a set as do all washi tapes (I think) offered by Cavallini. It can be found... here*. I used it a lot at Christmas and found the way the Cavallini tapes are designed to mix and match made creating so much fun. I also have their Flora and Fauna set, link... here. * I purchased it with Christmas credit but haven't had a chance to use it, yet. Like their Christmas set, it is designed to mix and match. They have other lovely sets that I don't own but you can view by clicking the above link. This is the other washi tape ordered from Amazon. It is bright and vibrant where as the other tape I've shown you is more of a vintage style. The link to the above tape is... here*. Most washi tape is decorated masking tape so it is transparent but I also have washi tape that is made of fabric. That is what the washi tape on the battery operated votive light above is made with. I have found that you get what you pay for when purchasing washi tape. The very cheap stuff often has only a small amount of tape on the spool whereas spending a little more gives you a whole lot more in size and quality. And really, compared to most art supplies, even the good stuff is not all that expensive. A reader asked what that was hanging under the bulletin board? This lovely personalized quilted wall hanging made by a dear blog friend. It makes me happy just looking at it while I work. She loves playing with her mouse that my husband tied to an old shoelace! Like ummm... Bigfoot, many photos of Victoria are blurred. Especially when in play mode. *All links to Amazon.com are Associate links. Love "your world" this week. Looks like you are "snowed in". Please be careful walking out. It's beautiful but tricky. Isn't reading such a wonderful, enjoyable pass time! I love books. Blessings, Sharon D.
I love how you are creating and sharing your creativity with us! I love Susan's book. I should do a re-read of it as well. I have started a new scrapbook journal! I am enjoying it very much. The sun is shining here today but more winter weather is on the way for this weekend. We usually end up with light snow or icy rain. It's not been too bad this year. I love the photos of your home. if you HAVE to be under the weather, I guess February is probably a good time to be in that state. You are not missing any gorgeous warm weather by cozying up on the couch to get better. Your blog posts are always so inviting, and I thank you for allowing us to "come on in" to your home, your world. I am pleased you are feeling better, Brenda. Thanks for sharing your days with us. Does your New England contingent have six feet of snow? I heard that's what folks in Massachusetts are dealing with. Two feet more than whatbwe've had here...another storm tomorrow and a 12 to 15 inch storm coming Sunday. I was surprised to see what your book selection was. You know, I think that I might go with it, too, because I can pick it up anywhere and feel as if it was a pleasant read. I hope you are feeling better! We have a very hot weekend in front of us and you have snow! Heard Sally Clarkson interviewed on Focus on the Family during the night (I was in and out of sleep.) Thought of you. I look forward to hearing what you whip up with that Kitchen Aid. It sure is attractive.